Green beans (Phaseolus vulgaris) are available in many cultivars and growth habits. Every green bean aficionado has a favorite, ranging from the tall pole bean to the short, prolific bush bean. 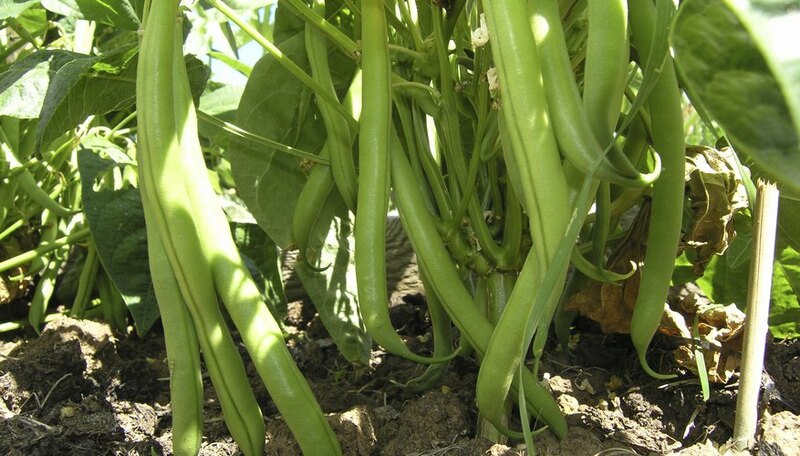 Green beans are easy to cultivate but are susceptible to disease under the right moisture and temperature conditions. Several fungi affect the leaves, pods, stems and roots of green beans. These fungi are usually present in garden soils but can build to high levels in areas where beans are grown year after yea. Fungi growth is more abundant in cool, moist conditions. Root rots are caused by the pathogens Fusarium solani, Rhizoctonia solani and Pythium spp., resulting in wilting, yellowing, stunting and death. Several species of the fungus Alternaria cause Alternaria leaf spot -- irregular shaped, brown lesions on the leaves. Anthracnose, caused by Colletotrichum lindemuthianum, appears as water soaked lesions on the aboveground portions of beans. The reddish-brown pustules of bean rust (Uromyces phaseoli typica) develop during long periods (18 hours or more) of humidity higher than 95 percent and in temperatures between 63 and 81 degrees Fahrenheit. White mold (Sclerotinia sclerotium) appears first as a water soaked spot on a leaf or stem, quickly followed by a white, cottony growth that can kill a plant in four to 10 days. Angular leaf spot (Phaeoisariopsis griseola) is the oddball of this group, favoring warm moist conditions to develop its tan to dark-brown lesions. To avoid fungal disease, space plants well apart for air circulation. Water early in the day so foliage will dry before dark, and avoid working in the garden during wet conditions to prevent disease spread. At the end of the season, remove leaf litter from the garden to deprive fungi of an overwintering habitat. Rotate beans with corn or grain crops. Bacterial blights are caused by a number of bacteria and can spread rapidly to defoliate entire stands of green beans. Common blight, halo blight and brown spot are all encouraged by damp conditions and windblown rain. Common blight (Xanthomonas campestris pv. phaseoli) prefers higher temperatures and appears as translucent, water soaked spots on leaves and seedpods. Halo blight (Pseudomonas syringae pv. phaseolicola) thrives in cooler conditions and develops small, translucent spots with a large, pale yellow halo. An infestation of bacterial brown spot (Pseudomonas syringae pv. syringae) appears as small, water-soaked spots with a narrow yellow band. As these spots mature, the center of the damaged tissue will fall out, giving leaves a tattered appearance. To help control bacterial diseases, water early in the day so foliage can dry before night. Space plants for adequate airflow and remove weeds and grasses to help keep foliage dry. Avoid working in the garden after rains or watering to prevent disease spread. Do not save seed, as some bacterial diseases are seed borne. Bean common mosaic virus (BCMV) and Bean Yellow Mosaic virus (BYMV) are transmitted by aphids and can be seed borne. Symptoms include stunting, mottling and malformation of the leaves. Younger leaflets are narrow with downward curling margins. Young plants are dwarfed, yellowed and spindly. Later in the season dark, necrotic spots appear on the leaves and petioles. Remove and destroy wilted, stunted or spindly plants. Manage insect infestations early, since insects such as aphids transmit the virus. Plant resistant varieties such as "Blue Bush 274," "Lancer" and "Tendercrop." Several species of root-knot nematodes (Meloidogyne spp.) attack green beans and are important pests in temperate areas. Aboveground symptoms include yellowing, stunting, leaf edge necrosis and wilting. The nematodes penetrate the root tissue and cause swollen areas called galls. Roots are short and thick, and fewer lateral roots are produced, resulting in a reduced root system. To help control nematode populations, rotate beans with grain crops or corn. Plant resistant cultivars such as the snap bean variety "Harvester."